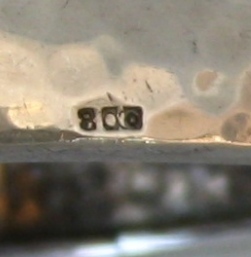 This is a brief history and a selection of Italian silver hallmarks from 1870 to present days. The documentation about this period of Italian silversmithing is extremely scarce and difficult to find. The objective of this page is to offer an introduction to this matter and a cue for a more deep study of this fascinating period. 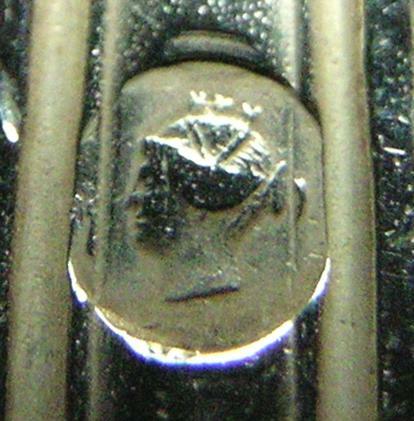 In 1870, with the conquest of Rome and the end of Stato Pontificio (Papal State), Italy attained its unity and an unique system of hallmarking was introduced in the Regno d'Italia (Kingdom of Italy). The law 2 May 1872 deregulated silver production and introduced only a facultative inspection of silver artifacts. Italian silversmiths rarely submitted their pieces to the optional official hallmarking. 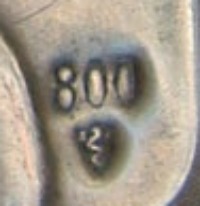 Usually silver pieces were marked only with the '800' (purity degree 800/1000), sometimes coupled with the silversmith's hallmark. 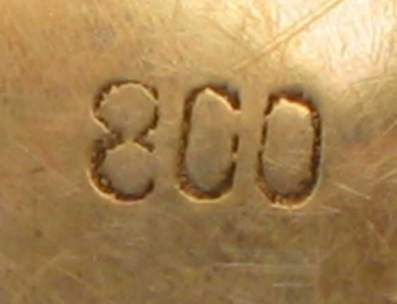 The '800' was an unofficial mark and there was no uniformity in its shape. The law 5 February 1934 n. 305 introduced uniformity in the shape of silversmith's marks. The availability of new lozenges was not immediate and for a short period the old marks with the obliterated 'fascio' were maintained. The Laws 30 January 1968 (Legge 30 gennaio 1968 n. 46) and 30 December 1970 n. 1496 (D.P.R. 30 Dicembre 1970 n. 1496) introduced new hallmarks for silver and precious metals. The mark was modified to a polygogonal shape and a star was added on the left. Numbers and Province letter were maintained. 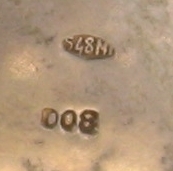 The 'Decreto Legislativo 22 Maggio 1999, n. 251' introduced a system of marks for objects made in precious metals and weighted with resin or mastic . The new mark is a R inside a square outline (the R is the abbreviation of 'Riempito' = filled in English). 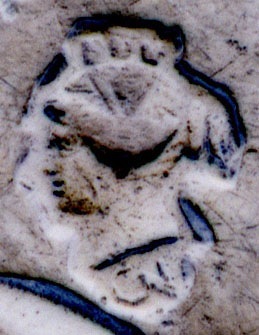 c) nei manici dei coltelli e' ammesso il riempimento con sostanze non metalliche senza pregiudizio dei limiti di densita', ed e' consentito altresi' che la lama sia fissata al manico con saldatura in metallo non prezioso a condizione che in ogni manico sia inciso il termine "riempito" o facoltativamente l'indicazione "R" racchiusa in un quadrato, accompagnata dalla indicazione del peso della lega di metallo prezioso, in grammi e decimi di grammo, seguita dal simbolo "g". 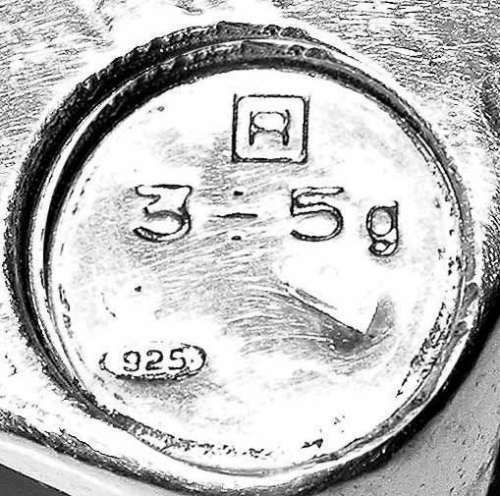 Nei manici in argento, nei quali il peso del metallo prezioso e' inferiore o uguale a 50 grammi, detto peso pero' puo' essere espresso anziche' col suo valore effettivo, in maniera approssimata, facendo seguire la lettera "R" (riempito) da una delle seguenti notazioni: due cifre, separate dal simbolo "�" seguite dalla lettera "g", nelle quali le cifre rappresentano, in grammi, i valori minimo e massimo entro i quali il peso stesso deve intendersi contenuto: 1�2, 2�3, 3�5, 5�7, 7�10, 10�13, 13�16, 16�20, 20�25, 25�30, 30�35, 35�40, 40�45, 45�50. 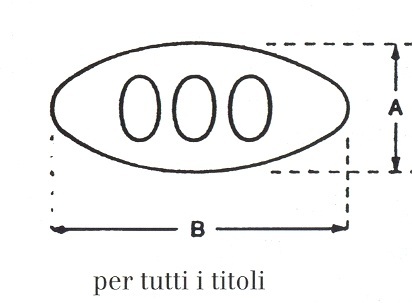 c) In the handles of the knives not metallic substance is allowed without limits of its density, and is allowed to fix the blade with welding in non-precious metal on condition that the handle bears the word "riempito" or the mark "R" within a square and the indication of the weight of the precious metal (in grams and tenths of gram) followed by the symbol "g". In the silver handles with a weight of precious metal inferior or equal to 50 grams the weight may be expressed in approximate manner, using the "R" followed by two figures, separated from the symbol "�" and the letter "g", in which the figures represent, in grams, the minimum and maximum weight of the precious metal: 1�2, 2�3, 3�5, 5�7, 7�10, 10�13, 13�16, 16�20, 20�25, 25�30, 30�35, 35�40, 40�45, 45�50.